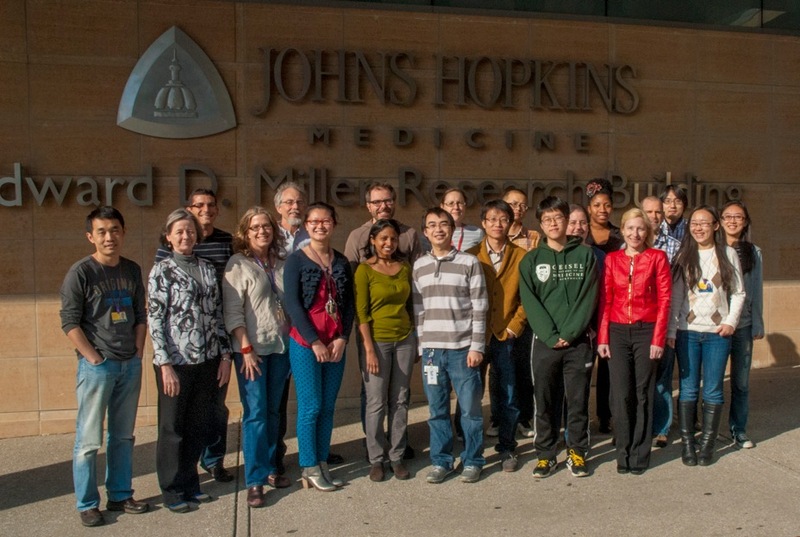 Welcome to the BOEKE Lab! Our group is focused on the mobile elements called retrotransposons that infest the genomes of all eukaryotes. We study their mechanism of movement (retrotransposition) and how they find their homes in their host genomes. Most of our work is centered on the Ty1 elements of yeast and on the human L1 (LINE) elements, which are responsible, directly or indirectly for over a third of our genome by weight. The Ty1 elements greatly resemble retroviruses but have one unique and interesting feature: they target very specific "windows" in the yeast genomes as sites of integration. We believe this targeting is dictated by a chromatin structure unique to these regions and are investigating the molecular mechanisms involved. In addition, because Ty1’s host is the highly genetically amenable yeast Saccharomyces cerevisiae, it is possible to carry out detailed molecular genetic analyses of the complex steps in the retrotransposition pathway, both in analyzing the transposon itself and host encoded functions. The human L1 element also transposes via reverse transcription, but it looks and behaves very differently from Ty1 and retroviruses. Integral to its insertion mechanism is an unusual DNA repair-like endonuclease that is not found in retroviral-like elements. We tackle retrotransposition mechanism and its regulation of retrotransposition at several levels - genetic, molecular, biochemical, systems/bioinformatic and more recently by redesign and synthesis of the elements. These comparative studies help define core conserved reactions of retrotransposition as well as highlighting retroelement diversity. We are also developing microarray-based methods to profile transposons in the human species to explore how significant retrotransposon movement is in natural populations. Our work on retrotransposons led us to studies of transcriptional silencing. We discovered a new form of silencing that occurs in the yeast ribosomal DNA (rDNA). Like other forms of silencing in yeast, this requires the Sir2 protein. The Sir2 protein is a member of a phylogenetically conserved family of NAD-dependent protein (lysine) deacetylases. Interest in this unusual family of proteins has expanded to a general interest in the myriad connections between lysine modifications and biology. One tool we’ve developed to study global genetic interactions is called SLAM, (Synthetic Lethality Analyzed by Microarray). This tool along with other “Omics” tools, can help assemble biological networks and organize them into pathways. Together with many colleagues at JHU and elsewhere, this has led a large project to better understand the networks and pathways or lysine modification. We are fortunate to be supported in this by an NIH Roadmap “National Technology Center for Networks & Pathways”. Lu, J.Y., Lin, Y.Y., Sheu, J.C., Wu, J.T., Lee, F.J., Lin, M.I., Chiang, F.T., Tai, T.Y., Zhao, Y., Berger, S., Tsai K.S., Zhu, H., Chuang L.M., Boeke, J.D. (2011) Acetylation of yeast AMP-activated protein kinase controls intrinsic aging independently of caloric restriction. Cell, in press. Dymond, J.S., Richardson, S.M., Coombes, C.E., Muller, H., Annaluru, N. Blake, W.J. Schwerzmann, J.W., Dai, J., Lindstrom, D.L., Boeke, A.C., Gottschling, D., Chandrasegaran, S., Bader, J.S. and Boeke, J.D. (2011) Synthetic chromosome arms function in yeast and generate phenotypic diversity by design. Nature, in press. Huang CRL, Schneider AM, Lu Y, Niranjan T, Shen P, Robinson, MA, Steranka, JP, Valle D, Civin CI, Wang T, Wheelan SJ, Ji HK, Boeke JD, Burns KH (2010) Mobile Interspersed repeats are major structural variants in the human genome. Cell 141: 1171-1182. Han, JS, Szak, ST and Boeke JD. (2004) Transcriptional disruption by the L1 retrotransposon and implications for mammalian transcriptomes. Nature 429: 268-274. Han, JS and Boeke JD. (2004) A highly active synthetic mammalian retrotransposon. Nature 429: 314-318. Richardson, S.M., Wheelan, S.J., Yarrington, R.M., Boeke, J.D. (2006) GeneDesign: Rapid, automated design of multikilobase synthetic genes. Genome Res. 16: 550-556. Takahashi, .H, McCaffery. J.M., Irizarry. R.A., Boeke, J.D. (2006) Nucleocytosolic acetyl-coenzyme A synthetase is required for histone acetylation and global transcription. Mol Cell 23: 207-217. Pan, X., Ye, P., Yuan, D., Wang, X., Bader. J.S., Boeke J.D. (2006) The DNA integrity network in the yeast Saccharomyces cerevisiae. Cell 124: 1069-1081. Wheelan S.J., Scheifele L.Z., Martinez-Murillo F., Irizarry R.A., Boeke J.D. (2006) Transposon insertion site profiling chip (TIP-chip). Proc Natl Acad Sci U S A 103:17632-17637. Dai, J., Hyland, E.M., Yuan, D.S., Huang, H., Bader, J.S. and Boeke, J.D. 2008. Probing nucleosome function: A highly versatile library of synthetic histone H3 and H4 mutants. Cell 34:1066-78.